Age – Generally speaking, Invisalign often works best for older teenagers and adults, in part because their teeth, jawbones and facial structure are more fully developed. Braces are usually better for younger teens and pre-teens because their jaws are still developing. Commitment – Invisalign provides the best results when patients can commit to wearing their trays at least 22 hours per day, which allows enough time for meals and brushing and flossing. Leaving Invisalign trays out too long can disrupt your results and extend your treatment time. With traditional braces, compliance isn’t an issue. 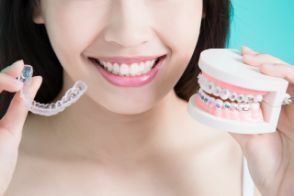 Severity – Invisalign has always worked well for people with mild or moderate alignment issues such as crowding, gaps, crossbites, underbites, or overbites. Now, with advances in Invisalign technology, even some severe cases can be successfully treated. However, for particularly complex cases, braces may be recommended to give you a better final result. Cost – The cost of Invisalign can be 20%-50% higher than braces, but every patient is unique, so the cost of any kind of orthodontic treatment will vary depending on your situation. The first step is to determine whether you’re a candidate for both Invisalign and traditional braces, and the best way to do that is to schedule a consultation with a dentist who offers both options. After they’ve evaluated your goals and needs, they’ll be able to make the best recommendation. In the end, what’s right for one person may not be right for another. But, regardless of which orthodontic option you go with, you’ll be on your way to having a straight, beautiful smile for life! Dr. Gary Chaffee graduated from the Loma Linda University School of Dentistry in 1975 and then pursued post-graduate training in Progressive Orthodontics (later becoming an instructor himself). In addition to providing outstanding general dentistry, he also offers multiple orthodontic options to accommodate each patient’s individual needs. If you have any questions about Invisalign or traditional braces, he can be reached via his website.